Happy Friday! 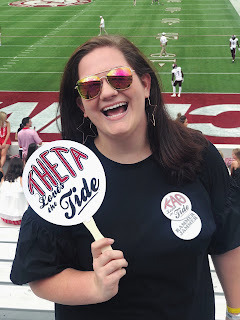 I hope this isn't too late for some of y'all because I know my county started on Monday. Even if you have already had your first day of school, these outfits are still great for school in general. The first day of school outfit was always super important to me. I seriously spent weeks thinking about it. I have always wanted to make a good first impression on my teachers. If you're struggling with this decision, I decide to help out and share some inspiration. I tried to create outfits using different trends and different styles. My first day of school is on Wednesday, and I am still not sure what I am going to wear yet. I want to look nice because it's the first day, but I also don't want to be overdressed because it is college. #FreshmanStruggles? This first outfit is obviously something that I would wear. I could write a book about how much I love stripes, and I think paired with a good pair of chino shorts that this outfit is a classic. Add a pair of super comfy sandals because you do not want to be getting blisters from walking back and forth in the halls and up and down stairs. 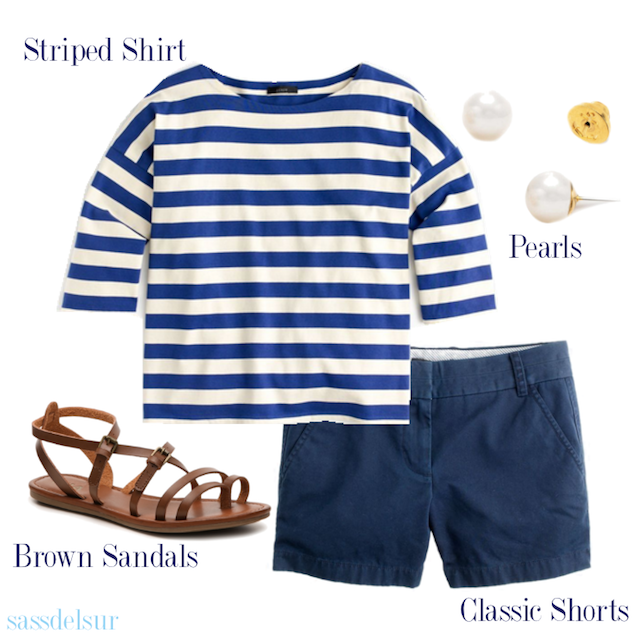 I am literally always wearing my pearl earrings, and they're the perfect touch for this outfit. I think this is an outfit my best friend, Tori, would wear if she wore jeans more often. (That girl lives in athletics shorts and sweatpants.) This outfit is more relaxed, obviously, but I still think it is just as cute. 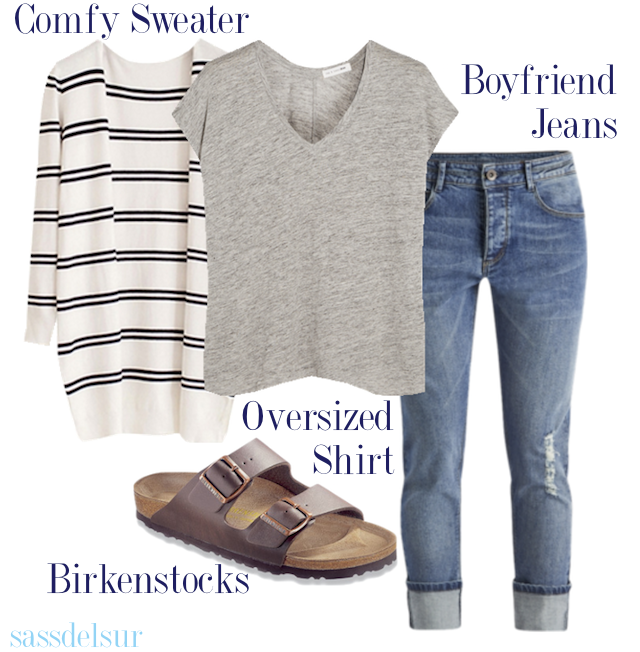 The Birkenstocks and boyfriend jeans give it a laid-back vibe, and the oversized sweater is perfect for all those cold classrooms. I swear, the classrooms in my high school were always 60 degrees even when it was 90 degrees outside. Swing dresses are my obsession. They are so comfortable and easy to wear, but you're wearing a dress, so you automatically look nice. 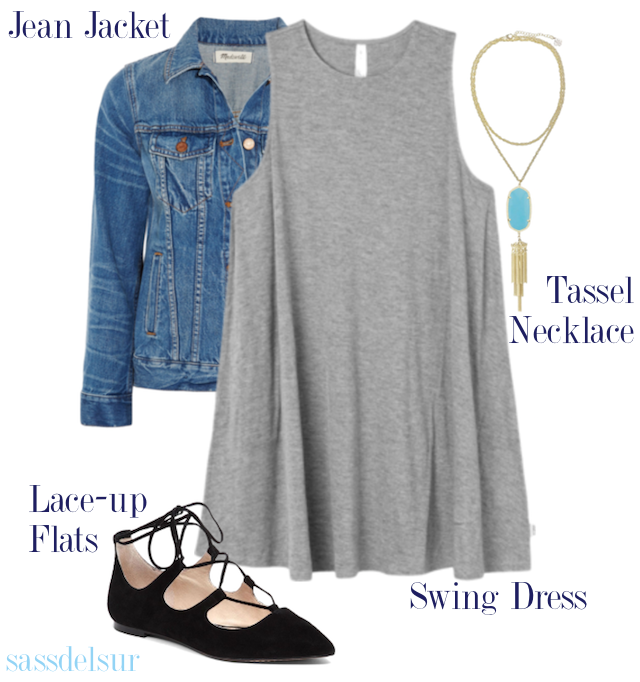 I think with a jean jacket and a fun tassel necklace you can really dress up a simple gray dress. Then lace-up flats are all the rage right now, and they are a super fun addition to a pretty basic outfit. Last but certainly not least... I love jean skirts with buttons down the front. I think they are super fun and kind of reminiscent of the 70s and the 90s. Plus they are the perfect piece to transition to fall and winter. 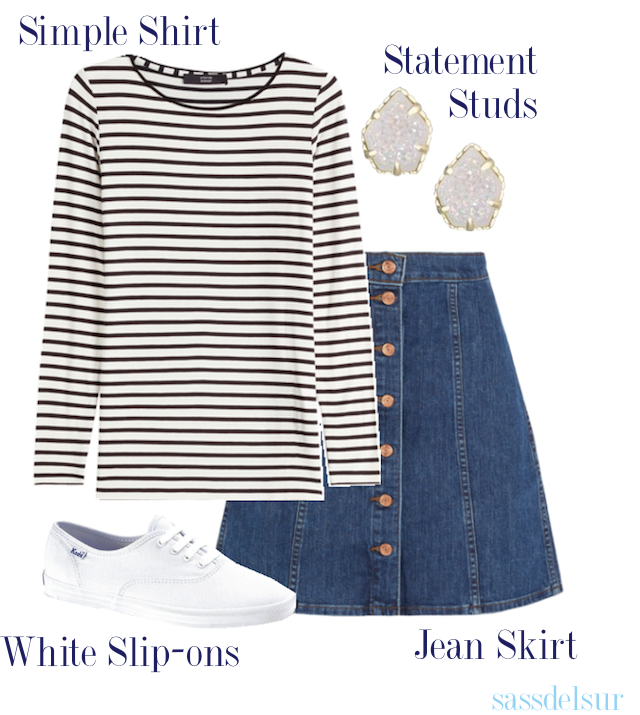 When paired with a simple shirt, striped or not, and white slip-ons, it makes for a very on-trend outfit. I added statement studs for a little bit of glitz.